There is currently no vaccine to prevent infection with herpes simplex virus type 1 or type 2 (HSV-1 or HSV-2). Infection with either of these viruses results in life-long viral latency. 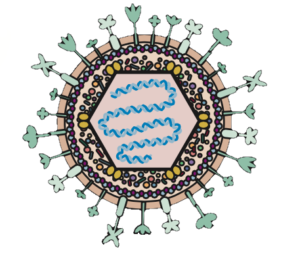 Sporadic reactivation and viral shedding may lead to painful oral and genital disease and an increased risk of HIV transmission. “VC2” is an infectious, attenuated vaccine candidate made by removing 37 amino acids from viral glycoprotein K and 19 amino acids of the UL20 protein. The deletion in glycoprotein K prevents the virus from entering the axonal termini of ganglionic neurons and establishing latency. The UL20 protein alteration prevents interaction between the N-termini of UL20 and glycoprotein K, which normally modulates virus-induced cell fusion. VC2 has been shown to safely and effectively prevent both HSV-1 and HSV-2 infection in mice. However, mice do not accurately reflect the immunological and inflammatory features observed in humans and hence do not make a good laboratory model for HSV infection. Guinea pigs are a much more suitable model for human herpes virus infection and disease because they closely mimic human disease caused by HSV-2. In a recent study conducted at Louisiana State University, Brent Stanfield and colleagues examined the immune response generated by intramuscular injection of the VC2 vaccine in the guinea pig. The study included three groups of guinea pigs. One group was vaccinated intramuscularly with the VC2 vaccine. The other two groups served as controls, with one group receiving a mock-vaccination of conditioned medium, and the other group receiving no vaccine. VC2 vaccinated guinea pigs were boosted twice, at three-week intervals. Three weeks after the second boost, vaccinated and mock-vaccinated guinea pigs were infected (challenged) intravaginally with HSV-2. Animals from each group were sacrificed at three different time points: one hour, three days, and eight days after challenge. As expected, mock-vaccinated guinea pigs exhibited significant pathological disease at eight days post-challenge. However, guinea pigs vaccinated with VC2 showed no apparent disease and also had significantly reduced, and almost undetectable viral genome copy numbers at three days and eight days post-challenge, respectively. Histological evaluation also revealed significant signs of inflammation, with infiltration of neutrophils and macrophages at days three and eight post-challenge in the unvaccinated animals. Pathogen recognition by innate immune cells leads to secretion of cytokines that signal the adaptive immune system and instruct naïve T cells to differentiate into the appropriate T cell subtypes required to clear the infection. Recognition of both HSV-1 and HSV-2 leads to differentiation of TH17 cells, which secrete IL-17 and IL-22. IL-17 confers protection by indirectly recruiting neutrophils and by working together with IL-22 to produce antimicrobial peptides and defensins. VC2 vaccinated guinea pigs showed induction of transcripts associated with Th17 and regulatory T cell responses as soon as one hour post-challenge with HSV-2. Specifically, the authors observed increased levels of IL-17, IL-22, IL-23A, IL-36b, IL-36g, and the antimicrobial peptide beta-defensin 3 (DEFB3). In an effort to see if human cells show similar immune responses, the authors stimulated cultured human vaginal epithelial cells with IL-17 and IL-22 individually, or with a combination of both cytokines. 24 hours later, they analyzed RNA expression of IL-36a, IL-36b, IL-36g, and DEFB3 in these cells. Consistent with the results observed in guinea pigs, they found that only combined stimulation with IL-17 and IL-22 induced a significant increase in DEFB3 transcripts. Treatment with a combination of IL-17 and IL-22 also reduced viral titers in HSV-2 infected cells to one third of the titers observed in untreated cells. The guinea pig shares many of the features of genital herpes disease observed in humans, including the establishment of latency in the sensory ganglia. The VC2 vaccine prevents HSV infection of neuronal axons and establishment of latency. HSV is of high public health concern, with HSV-2 causing the large majority of genital herpes cases. The ability of the VC2 vaccine to induce a rapid and effective immune response to HSV infection without causing immunopathogenesis is promising. However, the small sample sizes used in this study are concerning, and only clinical trials will be able to determine the safety and efficacy of this vaccine in humans.